Are you looking for a crossover that provides the very best in engine power as well as all-wheel drive for improved control on uneven terrain or inclement weather? The new Acura RDX AWD has you covered, and it’s available now at Rallye Acura. Under the hood is a 279-hp V6 engine paired to Acura’s intelligent All-Wheel Drive. What makes it “intelligent?” This system senses when traction is lost, sending power to all four wheels when necessary to keep you in control, then shifting to two-wheel drive for optimized fuel economy. Here’s the thing: you can test drive a new Acura RDX AWD for yourself by paying us a visit anytime. When you’re behind the wheel, you’ll see everything else this luscious luxury crossover has to offer, including the positively opulent Acura RDX interior. 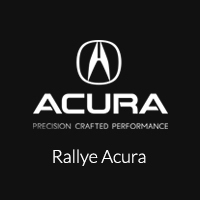 We look forward to meeting you soon at Rallye Acura!